The horrific shooting at Santa Fe High School reminds us all of the need to make our schools more safe and supportive. Three places to look for guidance are the U.S. Secret Service, the National Association of School Resource Officers and the recent history of state leadership on school discipline reform. The Secret Service points out that “targeted school violence is arguably only the tip of the iceberg of pain, loneliness, desperation and despair that many students in this nation’s schools deal with on a daily basis.” New data from the Centers for Disease Control and Prevention provide a haunting window into how widespread the problem is: 12 percent of Texas high school students — imagine 1 out of every 8 kids sitting in the school auditorium — attempted suicide last year. To reduce school violence, the Secret Service recommends focusing on creating cultures and climates of safety, respect and emotional support within schools. When schools address student mental health and help students develop skills for coping with emotional challenges, it helps prevent rare but horrible shootings and more common violence, such as bullying and suicide. But that’s not the only reason to do it. Supporting the emotional development and mental health of students also improves behavior at school and helps students focus on math, English and other subjects. That’s why, prior to the Santa Fe shooting, school districts including Austin ISD had hired more mental health professionals, though they recently reduced the staff due to budget constraints. Districts such as Hutto and Houston ISDs partnered with community groups to offer counseling. Each school district shouldn’t have to go it alone or reinvent the wheel. 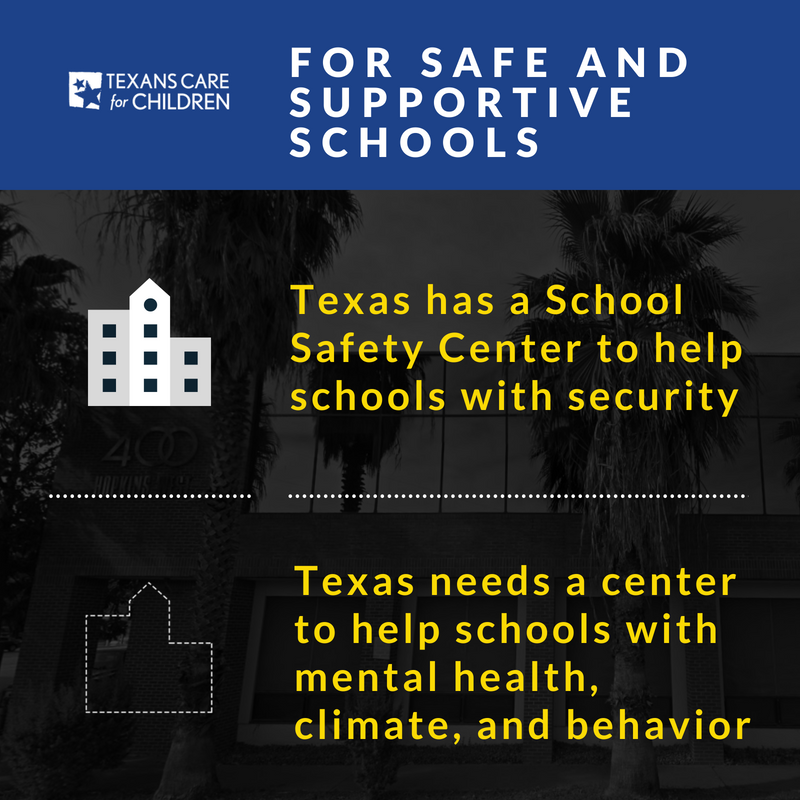 Just as the Legislature established a Texas School Safety Center to help districts handle security issues, it should establish a center on student mental health so districts have a trusted place to turn for training and technical assistance on social-emotional learning, student mental health, and creating safe and supportive school practices. The Legislature should also provide funding for mental health professionals, such as counselors and social workers, as Gov. Greg Abbott suggested. With limited funding available for new staff, legislators and districts should focus on hiring mental health professionals rather than more police officers. When districts do deploy officers, they should prioritize school security and avoid unintended consequences. The National Association of School Resource Officers has issued a recommendation to “prohibit SROs from becoming involved in formal school discipline situations that are the responsibility of school administrators.” Because school violence is rare, there is a temptation to call on officers to intervene in cases of minor misbehavior. To keep schools safe and avoid unwarranted student arrests, the Legislature should limit the role of school police officers to school security. The Legislature should also closely examine the process for how schools respond to potential threats by students. The majority of threats made by students are not serious. Schools should conduct an evidence-based threat assessment to distinguish credible threats from noncredible ones and to make the appropriate referrals when necessary. Addressing underlying concerns early — before small concerns can turn into bigger problems — provides the best bet for keeping all students healthy, safe and learning. Fortunately, Texas has been a leader in ditching the failed “zero tolerance” approach that took off in schools across the country in the 1990s. School discipline research shows that suspending or expelling kids doesn’t improve school safety or student behavior, but it does push many youth into the school-to-prison pipeline and increase the risk of students dropping out of school.